On June 24th, 2018, thousands of Canadians from British Columbia to Newfoundland and Labrador will take part in the Canadian Mental Health Association’s Ride Don’t Hide, the largest mental health bike ride in Canada. To roll out of bed. To utter the first words long hushed. To tie your running shoes and take your first strides. To break from habit and to move towards something new, something better. As I sit down to write this piece, the hardest thing to do is start. I am acutely aware. We all have mental health. Let’s start there. It’s an important point because it establishes common ground, a foundation to build upon. It’s a statement that allows for no exceptions. We all have mental health. You, me, we. It imposes a collective responsibility: to take seriously the pursuit of mental wellness, to show compassion to those who experience mental illness. Of course, mental wellness is more easily sustained by some than by others. I, for one, have found myself among the others. I can only speak for myself, and if I can say anything at all, it’s that the hardest thing to do is start. It wasn’t easy to open up about what had been going on inside my head and it wasn’t easy to figure out what to do next once I had. But, once I broke an impossible silence, once I decided to start, I felt that I had momentum to maintain. This led me to a renewed focus on my lifestyle and in particular, a concentration on physical activity. It was not easy to start. It is especially difficult to find energy after wrestling with your thoughts for so long. I’m proud to say that I did anyway, and that because I started I could continue. In time and with persistence, healthy living became critical to my pursuit of mental wellness. Unfortunately, there were times when this didn’t seem to be enough, times when I had to find respite elsewhere. During a particularly rough period, I found myself reading about the benefits of community involvement for those who suffer from mental illness. “Doing good is good for you”–I liked the idea. This led to the introduction of my own charity soccer tournament in support of CMHA, National. With the help of family, friends, and the community, the tournament raised more than $8000 over two iterations. The previous sentence is still a bit jarring for me to read. In the beginning I was riddled with self-doubt. I attached my name to a public project that could fail, and while I presented a brave face in leading the project, I was still engaged in my own personal battles. 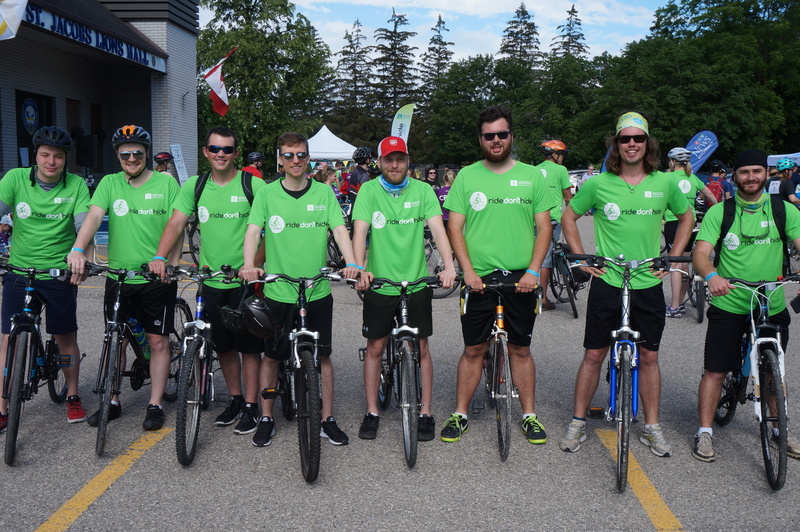 In 2017, I decided to participate in the CMHA Waterloo Wellington Ride Don’t Hide instead of running the soccer tournament. This was an opportunity to shrug off the pressure that I had placed on my own shoulders, but nonetheless an opportunity to feel good doing good. By captaining a fundraising team (SSHB Waterloo), I felt the positive buzz that comes from working towards a common goal and was reminded once again of the unwavering support I receive from my friends and family. My teammates and I had so much fun. To get where I am now, I had to start. That’s what I’d like to leave you with. Start by joining the conversation. By taking mental health seriously. By getting involved with Ride Don’t Hide. Start and let momentum guide you. My pursuit of mental wellness has had many starts and many stops. False starts. Restarts. There are more to come, of that much I’m sure. The important thing is to start, even when it is the hardest thing to do. Support Quinn’s team, SSHB Waterloo, or sign up for Waterloo Wellington’s 2018 Ride Don’t Hide.